“No recent calls from the Asylum has come in for two weeks, so officer Ben would you mind going and check on them. They always forget to report in to insure that their fine,” asked the sheriff. The drive was long and boring only trees on both sides of the road. Then a tall scary like brick building appeared from the never-ending forest. The door was wide open for some odd reason. No people were walking around or doctors checking on inmates. It… it was dead quiet. Then a faint insane laughter came from the room down the hall. Ben started to walk down there. “Whose down there? Is this some type of joke, if so it’s not funny…” Ben’s voice traveled off as he walk into the room where the laughter was coming from. In the room sat a young boy who wasn’t no older than 15. 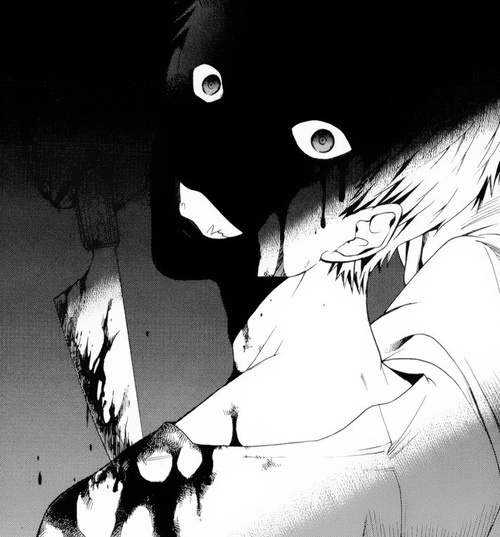 His face was covered by bandages besides his right eye and his mouth. He wore a straight jacket that was covered in blood. He held a large knife in his mouth. He had humongous smile as he pointed behind him. That’s when I seen countless number of dead corpse of doctors, inmates, strangers. “They all wanted to play, how about you?” he asked. Ben quickly pulled his gun out and shot at least twelve bullets. He was terrified, but relived to have stop the boy he was about to call. “That… that felt… good, do it again, do it again, I love it, love it when it tickles! So you do want to play?” he said cheerfully. Then he lunged his body towards Ben and drove the blade into Ben’s gut. “It’s no fun if you don’t struggle!” he shouted. Ben couldn’t move he was in shock blood rushed out of his gut and mouth. The boy just sat there with huge smile. What was this boy how could he be alive he searched around with his eyes he found the boy’s name as Ari and his inmate number as 4536785666. Then his vision blurred then he died. “Ari! Ari! Wake up Ari time for school,” my mother called. “Fine I’m coming,” I called back I quickly found a blue shirt and jeans on and hurried out to the bus. I got on any went to the back and sat quiet all the way to school. The day seems to drag on forever. Each classroom was even more boring than the one before. I was one my way to the bus when I heard someone call my name. “Ari, hey Ari did you see that your dad broke out of jail again, he doesn’t even care about you or your piece of s**t mom,” some kid name Greg called to me. “What did you just say?” I asked. “You, heard me b***h,” he answered. I got a fuzzy feeling in my head. I didn’t know what it meant, but it felt good. “What you want to fight?” he said then launched his fist into my gut repeatedly pounding his fist into my face. The thing is it didn’t hurt it… it tickled, I knew he wasn’t holding back so I couldn’t help but smile. “What’s so funny?” he asked frustrated to see he’s not even hurting me. “You… you hit like a b***h,” I said holding my laughter “now it’s my turn.” I hit him once and he was crying. Then the teachers came and grabbed us. “Why were you two fighting?” asked the principle. “He kept calling my dad a drunk and that he didn’t love me!” I snapped. “Why did you say that?” she asked Greg. “It’s true and everyone knows it,” he answered. “It may be true but…”she was cut off. I knew I was in trouble when I got home. “Ari why did you?…” she asked. “They said dad didn’t love us,” I answered. “Alright, good night,” I said relief to hear my mother soothing voice. “Mom!” I jump out of bed as fast as I could, and ran down the stairs to see a tall man stabbing my mom. I lunged at the man drove the long knife into his side. He howled in pain and whipped his gun and shot me in my left eye. I could feel my mind slipping away only one thought remain: kill! So I lunged the blade back into the blurry man he once again shot me in the head but this time it tickles no pain just laughter came from my mouth. It still doesn’t hurt. I sliced his throat then the feeling disappeared. As I was arrested they sent me to a far out asylum. “Kill them all!” the feeling came and I let go of all memory’s, all feeling, and did what I wanted to do and that’s kill. Each room had twelve sets of doors on both sides for, the fun of it I went in all rooms killing each person loving to hear the sound of persons neck crack or their screams. Finally I made it to the kitchen and grabbed every knife in the drawers and stabbed each one in my ribs and leaving them there so I would never run out of blades to kill with. “Son, get back in your room now,” Greg’s father snapped. Greg’s room was dark but he knew something was off. “Hey Greg want to play,” then a knife sailed right into Greg’s heart. “Come on play a little,” he said with a giant smile. Vicious stabbing back and forth as blood splashed every where his dad came into the room hearing the loud thud from Greg’s body. Thank you reading this and I hope you like it. If you think there’s something missing don’t hesitate to add some stuff. Not bad for a begginer writer. There are some mistakes, both in grammar and in punctuation, and at the end, it was difficult to understand who was talking. Ending was rushed, there was no explanation how the main character was able to kill everyone in the asylum. It seems like the Ari has no weaknesses and that is a big mistake that many make. Character with no weaknesses becomes boring quite quickly, because it gets everything with ease. You need to add something for your character to overcome, so that it wouldn’t be that easy, and the outcome would be more rewarding. Character with flaws, with weaknesses feels more realistic, and that is what every creepypasta writer wants – to make their character feel real. Maybe you could give him some kind of weakspot, like direct shot in the heart would kill them. I know, it would weight down your character alot, but he would feel like an actual human being. Also, there was no explanation about that evil voice. I think you need to build up to that, maybe your character heard that kind of voice since he was born? Or he witnessed something so terifying, that caused him to go insane and then he started to hear voices? And after all, simple bullying is not enough for someone to go on a killing spree (and it is overdone already, find another way to drive your character nuts). Other that that, keep improving and may the part 2 of your story be way better.